To kick off Black History Month, the University of Arkansas at Little Rock Anderson Institute on Race and Ethnicity announced 10 names will be added to the Arkansas Civil Rights Heritage Trail. The latest plaques will be unveiled at a “Legacies and Lunch” event beginning at noon Wednesday, Feb. 1, at the Ron Robinson Theater. The event will be held in partnership with the Butler Center for Arkansas Studies and the Clinton School of Public Service. 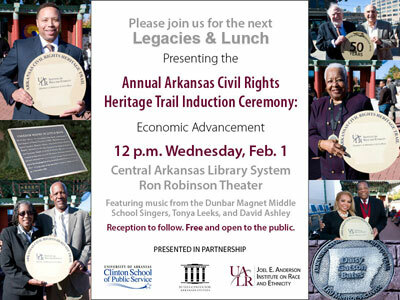 The event, which is free and open to the public, will feature live music from the Civil Rights era, including performances by the Dunbar Magnet Middle School Singers, Tonya Leeks, and David Ashley. A 12-inch bronze marker will be placed in the sidewalk for each honoree. The trail begins in front of the Old State House Convention Center on Markham Street and will eventually extend to the William J. Clinton Presidential Center and Park and other points throughout the downtown corridor. This year’s honorees include Sue Cowan Williams, a former English teacher at Dunbar High School who successfully sued Little Rock School District for equal pay between black and white teachers. In an article published in the Arkansas Times, Institute Director John Kirk described the large pay gap between black and white educators in Little Rock in the early 1940s. A 1941 survey for the Little Rock Classroom Teachers Association found that white elementary school teachers received an annual average salary of $526, while black teachers received only $331. At the high school level, white teachers received an average annual salary of $856, while black teachers received only $567. Another honoree is John Harold Johnson, founder of Johnson Publishing Co., which produced successful publications like Ebony and Jet magazines. In 1982, Johnson became the first African American to appear on the Forbes 400, a list of the 400 wealthiest Americans based on net worth. John Edward Bush, co-founder of the Mosaic Templars of America, a fraternal organization that expanded to 26 states and six foreign countries between the 1880s and 1930s. He was also chair of the Arkansas Republican Party. Robert Lee Hill, founder of the Progressive Farmers and Household Union of America, which organized in the Arkansas Delta to gain fair wages for sharecroppers after World War I.
John Harold Johnson built the largest black publishing company in the world, producing titles such as Ebony and Jet magazines. Walter “Wiley” Jones, one of the wealthiest African Americans in the South from his various business endeavors in late 19th century Pine Bluff. Chester W. Keatts, co-founder of the Mosaic Templars of America, a fraternal organization that expanded to 26 states and six foreign countries between the 1880s and 1930s. Josephine Irvin Harris Pankey, a successful real estate developer who accumulated large tracts of land in West Little Rock during the age of segregation. For more details, please contact the Anderson Institute at 569-8932 or race-ethnicity@ualr.edu.